The IEEE Spectrum piece doesn’t break any new ground, but it’s another example of the ‘Wow!’ signal getting broader coverage, and I now find that people routinely bring the Ohio State event up when I talk to audiences about SETI. Meanwhile, let’s think about some truly exotic possibilities when it comes to detecting extraterrestrial life. Would it be possible, for example, to detect signs of an alien civilization not just by a beacon, but by a spacecraft in transit between the stars? I was intrigued to learn that Robert Zubrin, of Mars Society fame, has investigated the question in a 1995 paper. The advantage of our approach is that the characteristic power levels associated with interstellar transportation systems are many orders of magnitude greater than those required for communication, and so the signal strength may be much greater. Furthermore, unlike communication which is governed by a fairly arbitrary selection of technology and mutually agreed upon conventions, transportation systems are governed much more stringently by the laws of physics. No understanding of alien psychology is necessary to detect a starship. But what kind of starships are we looking for? For the purposes of analysis, Zubrin has to rule out breakthroughs in physics that an extraterrestrial culture may have made but we have not — we have no way to characterize a ship propelled by something exotic like zero-point energy. But antimatter, fusion and fission rockets, as well as magnetic sails, come within his province. If the alien starship works within the limits of physics as we know them, then a speed of about 10 percent of lightspeed seems minimal — Zubrin selects this figure under the assumption of human-like life-spans so that the mission can be completed within a working lifetime. He also assumes that technological creatures are social and need a large crew for a long voyage. Image: Could we detect an interstellar spacecraft more readily than an accidental signal or even a beacon from an extraterrestrial civilization? Credit: Adrian Mann. …the maximum size of individual power plants has been growing at a rate of 2 orders of magnitude per century for the past two hundred years. Thus if present trends continue, the apparently astronomical power required of our standard starship should be common in 3 or 4 centuries, a blink of an eye on the cosmic time scale. Zubrin is interested in the spectral signature of the standard starship, which should be different from an astrophysical object because its position and speed should change over time. The hope would be that future space telescopes or even terrestrial instruments could detect an object like this in many wavebands. The problem becomes one of collecting enough photons on a detector. High-power antimatter drives should emit huge amounts of gamma rays, but at interstellar distances we get a rate of impacts per square meter of collection area that is quite small. The standard starship may evade detection. Consider: Zubrin calculates that a starship putting out 10,000 TW of 200 MeV gamma radiation at a distance of one light year from Earth would cause just 7.5 photons per year to strike a 1 square meter collection device. Such a spacecraft would be undetectable. The same problem occurs with X-ray emissions produced as bremsstrahlung radiation from a fusion engine (assuming D/He3), and while a detection within one light year is remotely possible, at 10 light years the impact rate falls to two per hour and the signal fades into the background noise. It’s in the realm of visible light that things begin to get more interesting. Visible light radiation from the ship’s exhaust becomes detectable through a telescope for many light years. Such an object at a distance of 1 light year would be seen from Earth as a 17th magnitude light source, and could be detected on film by a first class amateur telescope. The 200 inch telescope on Mount Palomar could image it at 20 light-years, and the Hubble Space Telescope at a distance of about 300 light-years… Since at least for the upper-end telescopes considered, the number of stellar systems within range is significant (100,000 stars are within 200 light-years of Earth) this approach offers some hope for a successful search. The light from the photon rocket could be distinguished from that of a dim star by the lack of hydrogen lines in the rocket’s emissions. More on this tomorrow, when we’ll look at magsail detection and the possibilities for other kinds of sails as well as worldships. The paper is Zubrin, “Detection of Extraterrestrial Civilizations via the Spectral Signature of Advanced Interstellar Spacecraft,” Progress in the Search for Extraterrestrial Life, ASP Conference Series Vol. 74 (1995). Available online. Could we narrow the search by presuming that a starship is probably in transit between two stars, not too far apart, with at least one planet not too different from Earth? Fascinating – I had no idea this work had been done when I speculated about it a little while ago. Could be well worth the effort of a search for this sort of signature. I’m puzzled by the idea that we have no way of characterising something using space-time metric engineering. I would have thought we could have characterised the effects of the warping of space-time on the local environment at least, although obviously we aren’t able to say what the method of production of such an effect could be and this would cause a problem for detection unless the craft was either quite close or the space-time distortion itself produced some measurable effect (really not my area, so I won’t speculate). I worry we may be missing a trick here as I have always been a little sceptical about extremely long duration interstellar missions, unless there is a really good incentive for leaving the home world. The absence of any obvious radio communications makes me suspect ‘they’ are either not there or using a more effective (e.g. faster) means of communicating. Thanks for highlighting this very interesting paper – looking forward to tomorrow’s article! Fantastic! I think this is the right SETI conversation to be having. The uncertainty of actually being able to detect another civilization, or in this case a star-ship seems to be increasing and explains why we have as yet detected anyone. I keep thinking that a form of neutrino communication seems to be the solution. I suspect not. While *we* may like to focus on propulsion systems, and therefore search for that, I think it’s better to consider the technology at play more broadly. Any technology used for propulsion is likely to have wider deployment in large industrial processes or engineering projects. These can be more numerous than spacecraft, and probably higher power since they’re fixed in place. While spacecraft will be more dispersed and also some will be closer to us than their home system, I would think that wherever they travel is also where they’d build similar industries. Then the question becomes one of waste. Propulsion systems may have more waste since they need to expel energy or mass (so far as we know) to accelerate. That’s a lot of “waste”. An industrial site (oh, maybe turning a star into unobtainium or something) would likely seek to reduce waste as a matter of engineering or economics. Our own civilization’s waste energy is high, as a percentage of production (artificial lighting, radio broadcast, …), although the absolute amount is probably low in comparison to a more advanced civilization. Therefore if fusion is the example to look for, look for all fusion byproducts rather than only propulsion exhaust. Zubrin makes a lot of assumptions, especially in regard to technology and alien physiology to justify the calculations. But given his 0.1c star ships and alien ≈ human lifespans, then the homeworld will be no more that 20-40 ly away (lifespan 200 yrs and 1 ly < starship detected 6.5 magnitude stars within 50 ly. Throw in fainter stars and you have maybe 500 possible homeworlds for such a starship. Couldn’t we just look at this tiny number of stars for interesting energy anomalies. Because if we don’t see any, and this implies no local star faring civilizations, then looking for a starship is rather pointless, unless the assumptions are invalid and it is indeed coming from a more distant location. The other issue I have is the transience of the star ship signal. It would be visible for perhaps 20 yrs (1 ly detection) to 400 yrs (20 ly detection assuming it was traveling close by. Unless star faring is easy and there is a highway out there, it would be incredibly lucky for us to be looking when the star ship is going by. By contrast, the Polynesian settlers on Hawaii c. 300AD looking out for a sailing ship (which arrived within 1500 years) would be a trivial time interval. Interestingly, the drive given as having the most chance of detection by our technology seems the least likeliest transportation system to be developed. Doesn’t an antimatter photon drive has a host of serious issues? Ranging from handling and transporting antimatter safely within the engine to finding ways of efficiently reflecting the annihilation fireball’s gamma photons towards desired directions. The “Wow!” signal was actually referenced two weeks ago in an episode of TNT’s Leverage, a series with a number of science-fiction buffs in its writing staff. The bad guy that the Leverage team was targeting that week was an amateur SETI buff, and they conned him by faking an alien contact. Were I a Romulan captain investigating Earth I’d prefer silent running….. 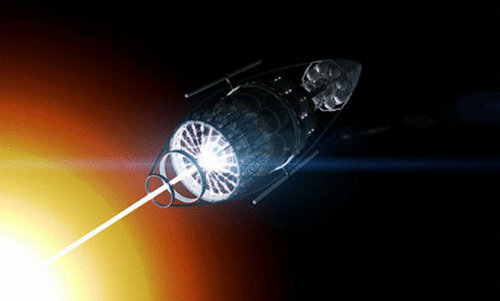 If they used a laser or particle beam to move gas away from the front of the ship or even if the ship hits the interstellar gas would this not create a bow wave in front of it, in effect it would become a weakly visible ionised gas cloud which would reflect light from the exhaust better increasing the chances of detection. D. R. J. Viewing, C. Horswell, E. W. Palmer, “Detection of Starships,” JBIS, 30, 99-104 (1977). The Viewing , et.al., paper looks at two kinds of starships, Innocuous and Energetic. Almost the same propulsion systems are considered as in Zubrin’s paper. That paper got me interested in what truly relativistic ships would look like in the simple case when a propulsion system does is not 100% efficient, and looses energy by waste heat. Suppose that in it’s rest frame it radiates isotropically. A simple relativistic kinematic effect will be that the radiation will be beamed relative to another rest frame. Called the ‘head light’ effect in special relativity. A. A. Jackson, IV, “Ultra-Relativistic Starships,” JBIS, 32, 240 (1979). I was going to pursue more aspects of this problem but never got around to it. I don’t know if anyone wrote any other papers about observing relativistic ships. One of the reasons for continued study of propulsion systems for interstellar flight is that some civilization may have already achieved it. I think it’s out in the tail of the distribution for SETI but still worth poking round at. I once thought , when the number of Gamma Ray Bursters became large there was big alien invasion fleet bearing down on us! A large enough starship or space station orbiting a star may also be detectable by looking at the light curve of transit. I recall an article on this site about it pointing to a paper by Luc Arnold. The tungsten core photon rocket Zubrin describes in “Entering Space” is too under-powered for the thrust levels described, plus there’s some muddled numbers in the table comparing different starship drives. A photon rocket, to get decent thrust, would need a plasma core at about 30,000 K – a hot uranium plasma might be possible, though the fission products from the anti-proton annihilations would be hard to contain. Seems likely to me that any civilization capable of building star ships would have advanced to K-2 level, so we might look for signs that a star is being used extensively for power production. The most likely sign, IMO, is thermal radiation without spectral lines, due the the radiator surfaces being outside the star’s atmosphere. Maybe some monochromatic lines besides, from power beams that miss their target. The basic problem with looking for the star ships themselves is that efficient propulsion systems might not generate much of a signal from the ship. For example, a mass beam being reflected would be highly efficient, but would radiate in inverse proportion to how efficiently you reflected it. Maybe look for mass beams themselves. They might have some effect on the interstellar medium. I don’t believe in photon drives powered by fission. After you’ve extracted the energy to produce the photons, you’ve got all that spent fuel sitting around. You’d have gotten more thrust from it by using it as the exhaust, instead of the photons. The same applies to fusion. Photon rockets make sense in the case of antimatter, because matter-antimatter reactions don’t leave behind ‘ash’ to serve as reaction mass. But outside of that special case, you’ll always generate more thrust using the spent fuel as reaction mass, than you would running a photon rocket and dumping the spent fuel. That’s basic physics. Mi scuso se vado un pò “fuori tema”, ma vi chiedo: la presenza di un “wormhole” di origine artificiale, nelle nostre “vicinanze”(non lontano dal nostro Sistema Solare) come si evidenzierebbe? Saremmo in grado di rilevarlo? I apologize if I go a bit “off topic”, but I ask you: the presence of a “wormhole” of artificial origin, in our “distance” (not far from our solar system) as it would show? We would be able to detect it? Let’s consider even more known physics and long transit times at speeds of .05c using nuclear pulse propulsion similar to the Orion ships of Freeman Dyson. At what distance could they be detected and how to go about the calculation. Assume a pulse yield of say 100 KT and assume it is a 1 KeV blackbody. One can then calculate a spectrum vs time (using Stefans Law) assuming it is the pulse unit “debris” that is being heated. This tells you how much time a pulse lasts too, on the order of a hundred nanoseconds I’d think. How many pulses/day? Dunno, make a guess. If you accept transit times on the order of hundreds or thousands of years then maybe only 1 to a few pulses/day. Somebody else do the calculation for me,it’s been too long since I did similar stuff. It’s negative gravitational lensing. Very interesting! And that bring up sometime I should have mentioned a few months back when neutrino communications in the context of interstellar communication were discussed. It transpired that a big problem was that limitations to their reception devices looked absolutely fundamental, and rather high. As I have previously brought up on these pages, the neutrino data that we tend to use from SN1987a is not the full set, but a set with the tight bunch of 5 neutrinos that the detector under Mont Blanc recorded from the direction of the LMC. This makes that set invalid for some purposes, eg the trimmed set cannot be used as evidence that neutrinos are subluminal. What I later realised is that if this 5 neutrino burst is ever explained by any mechanism (whether FTL or subluminal) that explanation also has to include why other seemingly more sensitive detectors (but that all used other detection methods) failed to detect this burst that proceeded the main one by five hours. It seems to me that almost any explanation must involve the fundamental limits to neutrino detection being far lower than current models allow!!! oops, above I wrote “with” instead of “without” for those 5 unexplained neutrino events. I see a lot of issues with this way of thinking, first of all i don’t really think the aliens themselves will use starships for “travel purposes”, don’t matter how advanced they are, robotic exploration will be easier and with advanced AI much further than we have that will be probably better than send humans (i mean an aliens) to explore space. The only exception for interstellar robotic exploration will be the case of definitely colonize a new planet or in the very firsts interstellar flights, even if that’s unlikely. I don’t really think any civilization will send a significant number of “manned” starships to explore space with no destination or higher purposes. Then the only left for detection is the robotic starflights that of course will be the smallest possible to become easier to accelerate it. As i say, any civilization advanced enough to send any insterstellar spaceship will have a much further IA, meaning they just don’t need to risk their life in space, with rare exceptions. I stay thinking that we need to detect their communication signals and try strategies to detect them in their home planet, like the old and good “advanced civilization planets have lights at night and communication signals” idea. And of course, we can send signals of many natures to the most promising exoplanets to see if any advanced civilization can detect it, for example we can send neutrinos to them, for us neutrinos are PRETTY HARD do detect, but for them maybe its a common way of communication and them mastered the way to get these signals, radio waves and any other for of communication stay in the list as well. Just an thought – would the bow shock from where the ship cuts through the interstellar dust emit any kind of traceable signal? Assuming it would have some sort of shield to protect the ship (or funnel it into an engine via a magnetic field, e.g. some proposals I’ve seen for ramjet drives). Here faster travel would obviously mean more of a signal. This would appear to describe exactly what I was wondering about – detectable relativistic effects near such a craft such as time dilation effects – although one would need to be quite close to experience it. By the sound of it the effect would have a certain ‘Alice in Wonderland’ or Wizard of Oz like nature (e.g. a personal time line running more slowly than for observers some distance away, giving the impression of a gap in the timeline, or missing time for the observer who passes close to such an object and then moves further away and compares watches with more distant observers etc.). There could be some interesting optical effects too I suspect, from refraction. Taken collectively (and with today’s article to come!) this seems to add up to a suite of at least tentatively diagnostic signals for a range of different possible advanced propulsion technologies. I cannot help but feel that anyone actually reporting such an observation, or at least one close to earth, would be instantly regarded as a ‘nut’ and dismissed. Hopefully this sort of discussion will ultimately help in a small way towards incorporating such searches into SETI methodologies – but I doubt it will. Excellent! You’ve anticipated me. See the Tuesday post, which I’m almost ready to publish. It gets into exactly the same idea. Very interested in the next post, ie todays. I have always wondered why no one has talked about detecting a solar sail, or magsail around an alien star. On this page I know we have discussed the economics of a METI program and suffice to say the answer seems to be that it is way outside our price range for a couple centuries; however, it is often discussed that large sails could be grown/built in space cheaply and easily, and they can even change their transparency, with today’s tech. “thing”. Radial velocity follow-ups would show no wobble for this dip in light meaning it has little to no mass. Then the civilization controlling the sail could alter its reflective properties thus allowing for the transmission of information. The civilization watching would surely flag this as bizarre and follows would be preformed. Surely it would not take long to realize that only an intelligence could be the cause of such a pattern. Looking forward to reading your thoughts tomorrow Paul. The same idea as burning ditches of oil in the Sahara in the shape of a triangle to communicate with Martians? Your thought reflects A C Clarke’s idea that we might be like an isolated tribe not hearing signal drums and assuming there is no one else in the world, whilst being oblivious to the radio waves passing by. I sympathize with the thought that we are looking for outriggers. Unfortunately, without recourse to new physics, we are in the position of not looking at the sky because we haven’t a clue how to recognize an aircraft. One drawback of looking for starship signatures that I can think of is that starships can be anywhere. They’re not necessarily restricted to stars with habitable planets, or even stars at all. They could be in transit between stars. This means that we’d have to actually scan the whole sky in order to find them, with no easy way of narrowing our search, unless we can develop some means of trying to guess which star systems are most likely as launch and destination points, plot likely starship trajectories between them, and focus our searches there. This very idea was examined in a preprint accessible in the arxiv from I think 2005. From what I recall, the author showed that the transit signal of a huge triangle could be distinguished from the signal of a similar size exoplanet. Did not think of that! Indeed they should be able to detect that, however, if they did see these things they still would not be able to receive a message from us. I will look into that paper, sounds interesting. I didn’t even think of what would happen if the shape of the sail was changed! Very cool. @David, I have done some looking on arxiv and have not found the paper you have mentioned, perhaps I will come back later with some new search terms and try again. I did, however, find another paper (http://arxiv.org/abs/0903.3212) that, if I followed correctly, would suggest that having a solar sail in a stable orbit within the plane of the planets would be difficult as the solar radiation pressure would render Keplerian orbits unstable; however, a bound orbit around a star is possible. The orbit would be either above or below the plane of traditional keplerian orbits. The amount above or below this plane depends on the angle the sail is tilted and the sails reflectivity. The period of the orbit is also greatly increased and can be changed by altering the sails reflectivity or tilt. One thought I do have though is that although the solar sail can not orbit in the plane of the planets, the sails orbit’s procession could be in the plane of the planets. So, using a solar sail in orbit of the sun does still seem to be a plausible way to construct a METI device to me. And if seen I think that it would be extremely obvious what it was due to, its strange orbit, the inability to follow up with transit studied with Doppler shift measurements, and the long period of its orbit. The orbital elements can be altered allowing for information to be embedded in the transit timings. Add to this the objects shape does not need to be circular it could be a triangle (or necessarily the same shape all the time), and as David suggests this to would be detectable. This is just the opinions of an enthusiast inspired by these detecting ETI articles. Phil, I love how the natural instability of that sail configuration could be made to allow its orbit to slowly progress through every potential line of sight (but still allow several eclipses for every observer). I also love that you brought up the topic during a discussion using a standard starship of a million tons. This allows a BOTE calculation. From what little I know, we think the lowest density for a sail that we could extrapolate from modern produced materials is about 0.1 g/m^2. So a sail comparable in weight to that standard starship would be 10 million square kilometres, or about 8% the cross-section the Earth presents. Both starship and sail look like they are detectable at comparable distances to me. Both are the same weight, but starships should be orders of magnitude more expensive to construct and run. Against this we must weigh that we only expect a return on our investment in the order of 10,000 years for the signal sail, whereas we would expect it within 100 for a starship. Maintenance and *space traffic control* costs on the running ETI should be weighed accordingly. When all is factored in, I am not entirely sure that starship production is not a more cost effective METI than those signal sails – even though from a human (lifespan 100 years) perspective, those orbiting sails might look very good. @Rob, Glad you find my speculations interesting! I actually did not think of letting the sail drift in its orbit to allow it to cross all the lines of sight. That is really interesting. I also am very interested in the size calculations you did. That puts things into perspective for me of how hard it might be to construct such a sail. 8% of cross-section of Earth is pretty good. Although I think your density estimate may be a bit low. This paper (http://arxiv.org/abs/1012.5250v1) suggests that we are currently capable of about 30 g/m2 on the high end to 1 g/m2 on the low end. Again you estimate is for what is possible and mine is what we are currently capable of. And just think. If we got a small sail up doing this work for us today, it could be shifting asteroids into NEO tomorrow, and creating an entire industry around making more and more sails at ever increasing sizes. The other thought I have is that the sail does not necessarily have to be built to absorb visible light. It could be made to absorb a larger wavelength of light and thus simplify it’s construction further. I do not quite understand how this works, so I will leave it at that. Great discussion! Good to know I am not completely loony. Why is that? If the sail is tilted 45 or 135 degrees to the star won’t it either gain or lose average orbital velocity? This was the basis of tacking the sails to a target and returning. If so, the sail should be able to maintain a stable orbit by dynamically adjusting its angle to the sun. Is there something I’m missing? Phil, if these sails pay for themselves in other ways and are only used for METI in their down time, that would nicely answer main objection to them. My 0.1 g/m2 estimate of what is possible by extrapolating from today’s technology is based on claims by Timothy Knowle of Energy Sciences Laboratories for a particular high carbon fibre aerogel type fabric that he was working on to that ends. Mention of his work appear frequently on the topic, but to the best of my knowledge the only direct material on it is in the form of old preprints. Was it a dead end?? Your suggestion of the sail being built to absorb a longer wavelength, thus making its possible density (presumably) even lower and the nature of its artificiality greater to an observer, sounds very interesting. @Alex, I have no idea. I took two years of Physics @ university, but I must say the orbital dynamics of these sails are a bit above my head. Most of what I took from the article was in the conclusions and summaries. I am sure if I sat down and plugged away at it I might be able to figure it out. What you are are saying makes sense. If the sail dynamically shifted its angle and reflectivity presumably it could fly where ever it wanted I suppose (so long as you take into account the slow acceleration). It sounds kinda of like you are suggesting doing “S-turns” in order to keep the sail in the plane of the planets and still blocking light from the star (you could always turn the sail side on to the star in which case it would orbit like a Keplerian object as it isn’t reflecting light”). That seems to make sense, and I do not see any reason that would not work. @Rob I have heard of Timothy Knowle. I am not sure if his work is a dead end or if it is still going strong. I am sure Paul would know much more about this. I will attempt to do some searching later today to see what I can come up with. The numbers I presented were for proposed missions using a solar sail. Even these might be underestimates as they are not built and working sails either! One, this relativistic effects only become important when you are very close to the Sun – well inside the orbit of Mercury. Two, light pressure can give you a “levitated orbit” (i.e., one that is not centered about the center of mass, but in some plane above or below the center of mass). But, it doesn’t have to. So, I think “need not orbit in the plane of the planets” would be a better statement. Note that that is not at all the same as having an inclined orbit, which you certainly don’t need radiation pressure for. Marshall Eubanks, of cause you can have solar sails orbit in one plane, but can they then form simple closed curves without complex adjustments? Simpler adjustments are of the sort where the sail is either always at the same angle to the sun, or always rotates at a uniform rate. this could be the best proof the only way to travel is with a breakthrough discovery. Previous post: Are ‘Waterworlds’ Planets in Transition?